Earlier this year, during the 2018 legislative session, Colorado Republicans held a one seat majority in the state senate. This was enough to stop a poorly written and heavily rushed Red Flag Bill from becoming law. 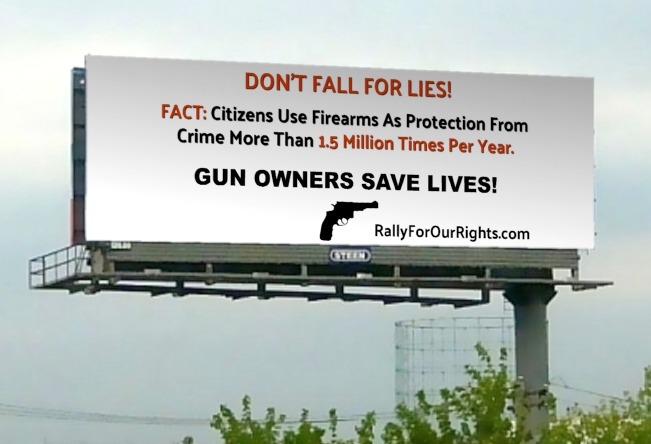 Unfortunately for those who support gun rights and due process, that single seat was lost in November’s election along with several others, and 2019’s legislative session is expected to be a fight – with a Red Flag Bill a top priority for lawmakers who are proving to be against the civil rights of the same citizens they were elected to represent. Here’s a thorough breakdown of the last Red Flag Bill Coloradan’s faced, as well as details about the major issues within such legislation. The issuing of an Extreme Risk Protection Order (ERPO) begins with the petitioner making a phone call, at minimum, to the court to request an ERPO. There is no verification or proof required for this phone call. This call could come from someone claiming to be a “dating partner” or a “family member”. Your bitter neighbor could claim to have had an affair with you. There is no limitation to how long ago you dated or who the family member is, or even if they are in the state of Colorado. The court must issue a hearing by telephone or in person with the petitioner that same day or the following day. The judge will hear a “preponderance of evidence” from the petitioner, and only the petitioner, with the goal to convince the fact finder that there is a greater than 50% chance that the claim is true. This is comparable to a “he said – she said” argument, only the accused gun owner is not informed or allowed to contest the petitioner. This is a Kangaroo court, and the gun owners’ damnation is absolute. 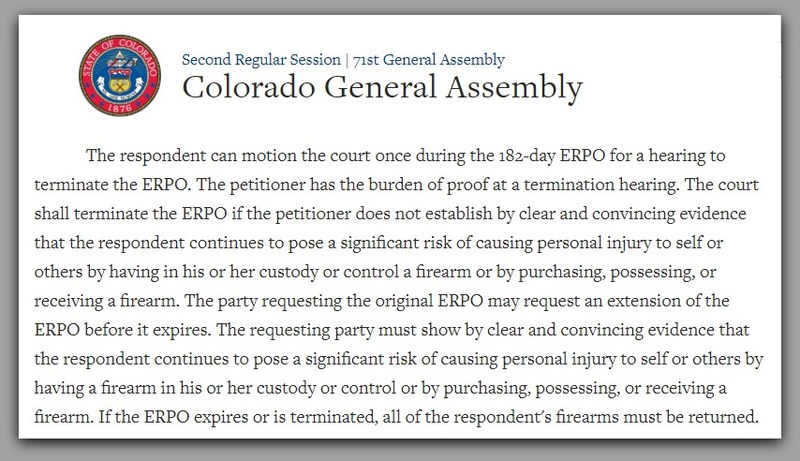 In the court hearing, evidence such as access to a firearm or purchased ammunition is enough to issue a temporary ERPO. Once the temporary ERPO is issued, the gun owner is then declared a “dangerous person” and a good faith effort is made to issue the gun owner a statement that they can no longer be in possession of a firearm. The gun owner must sell the firearms, transfer them to a Federal Firearms Licensed dealer, or hand them over to the police. It is at this point the accused even learns such a case has been brought to the court. They must comply, no questions asked, or they may face death, as we recently saw in Maryland. 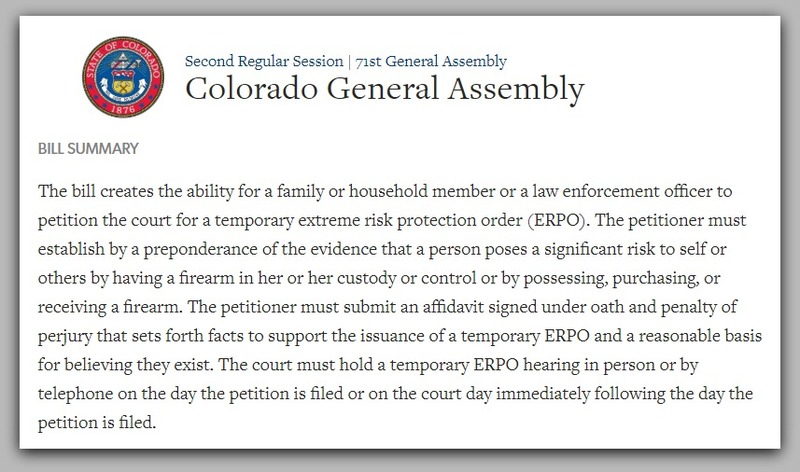 Seven days after the temporary ERPO is issued the gun owner can have a court date where they are responsible to provide an attorney to defend themselves. Because they have not been accused of a crime, they will NOT be read their Miranda Rights and an attorney will NOT be provided to them. They must proceed pro-se or hire an attorney. If this bill is for mental health, the Petitioner just cost the gun owner thousands of dollars in legal defense fees; funds which could have otherwise been spent on treatment. This bill states that “clear and convincing evidence” is the requirement to issue a EPRO for 182 days. It also states that having any access to a firearm or the purchase of ammunition is clear and convincing evidence. Because the bill lists the purchase of ammunition as clear and convincing evidence, it has short changed the higher standard of evidence for one that is almost as low as the preponderance of evidence requirement. Then if found innocent of everything, you are not guaranteed to be removed from the NICS database and therefore cannot get your firearms back. If you’re a resident of a city such as Boulder, where an “assault weapons” ban allowed a grandfathering period where you could get your firearms certified, if you did not certify your firearms, you will not be getting them back. Bottom line: If you are issued an ERPO, you will have to give up your firearms, you will have to provide your own legal defense at your cost, your name will go into the NICS database as being prohibited from having a firearm, all before you go to court to prove your case, and never once will actual mental health be a topic. Don’t be fooled, this bill is a gun grab bill in the name of mental health, where gun owners must give up their property before due processes is given.